This post is about a site that meanwhile has disappeared: Camille Vidal's Garden of Eden, created in the 1950's/60's in the community of Agde in the south of France, along the Mediterranean coast. When in 2009 I wrote the first version of this post, it was rather difficult to find information on the internet about Vidal's life and works and pictures were not available. Then, in 2010 Laurent Danchin sent more biographic information (see comments below), in november 2013 Jean Louis Bigou published on his weblog a reprint of an article by Yves Rouquette (see documentation) and in may 2014 I could add Radek Labarzewski's pictures, that show some sculptures of Vidal as currently exhibited in la Fabuloserie. Camille Vidal (1894-1977) was a mason and cement maker who lived in Bézièrs in the south of France. At a later age he settled in nearby Agde. 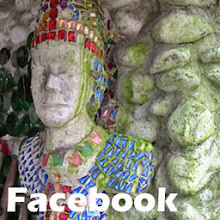 Retired around 1955, Vidal began making sculptures from reinforced cement which he displayed in the garden around his house. He impersonated people that were part of his perception of life and the world around: Adam and Eve, french personalities like Clemenceau and Fernandel, and world leaders like Churchill. All together Vidal made some 150 sculptures. It is not clear if Vidal himself had given his site a name, but this art environment has become known as the Garden of Eden, In their book Les bâtisseurs de l'imaginaire Clovis and Claude Prévost used the name Arche de Noë, Noah's Ark. After Vidal died in 1977 the house was sold. The new owners were not amused by the presence of the sculpture garden, mainly because it generated visits by interested people. Fortunately, before the garden was demolished, Alain Bourbonnais, director of the french la Fabuloserie museum in Dicy, bought some 54 items (Laurent Danchin reports that at the last minute the city of Agde wanted to acquire the sculptures, however without caring to pay for it). 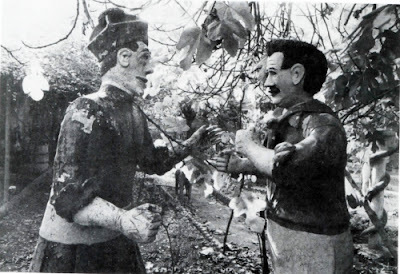 As the first two pictures show, the rescued sculptures are displayed in la Fabuloserie in front of a red wall. This wall is a construction designed by Alain Bourbonnais. It has no artistic relation with Vidal's site and its decorations are rescued items from François Portrat's art environment. The site in Agde has disappeared completely and currently no one over there seems to be aware of (or would be pleased to be remembered to) the fact that the city once had such a wonderful collection of outsider art within its borders. * French photographers, film makers and writers Clovis and Claude Prévost have documented Vidal's creations in their publication Les bâtisseurs de l'imaginaire, Ed de l'Est, 1990, -275 p.
"Agde a toujours été une ville d’art et de culture. Depuis toujours, les initiatives artistiques y fleurissent, portées par des créateurs dont les œuvres sont venues régulièrement nourrir notre patrimoine. Aujourd’hui, la Ville, s’inscrivant dans cette tradition, encourage les pratiques culturelles en particulier en développant les équipements et en en favorisant l’accès au plus grand nombre". If this is so, bravo! !, but their Journal makes no mention whatever of sculptures by Camille Vidal, that might have been part of the cities patrimoine.... Well, one never knows, you have a lucky hand in tracing abandonned houses, so what about finding the secret garden of Agde? Dear Mister Henk Van Es, Lucienne Peiry (Collection de l'Art Brut, Lausanne)warmly recommended me to visit your site in a recent E-mail. I already knew it but hadn't read you for a long time. Here are a few data concerning Camille Vidal. To my knowledge, he was born in Narbonne in 1894 or 1895 (this should be checked) and died in Agde in 1977. He was first a cement maker and mason in Béziers before he settled in Agde, where he retired and started making his Garden of Eden (Jardin d'Eden) or Noah's Ark (Arche de Noé) around 1955. 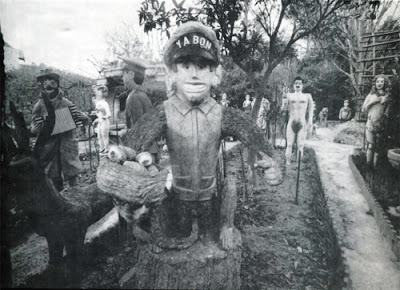 54 pieces from his garden were purchased by the late Alain Bourbonnais (1925-1988), the owner of La Fabuloserie, in 1982, five years after Vidal's death. The house had been purchased by a couple from Toulouse as a week-end or holiday house, but Bourbonnais said they disliked keeping those sculptures around the house because people use to come and ask for a visit. When they were about to be taken away by a truck, there was a local mini scandal because the town finally wanted to keep them but without paying anything to the owners. Claude and Clovis Prévost made a good photographic reportage on the garden in situ and an interview of Vidal, which were presented in their show "Les bâtisseurs de l'imaginaire" at the Maison de la Culture in Rennes, from December 2nd 1977 till January 2nd 1978. These photos and interviews were later published in their book "Les Bâtisseurs de l’Imaginaire", Jarville-la-Malgrange, Editions de l’Est, December 1990. With a dozen other major environments like Cheval, Fouré, Landreau, Picassiette, Chomo, etc. With my congratulations for your very interesting blog.